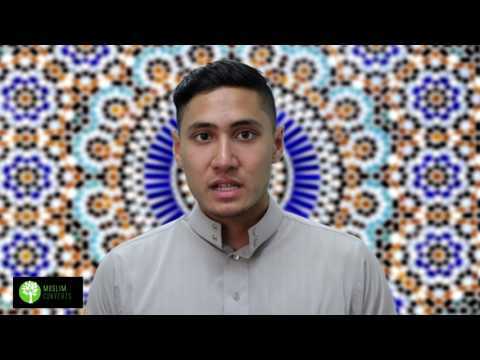 In this lesson, we’re going to be looking at the Qur’an on a more “structural” level. Here we will look into how the Qur’an is divided, the geographical and temporal division of verses, as well as the origins of its descent unto the earth and the reason why the Book was revealed in the Arabic language. "…when I was midway on the mountain, I heard a voice from heaven saying "O Muhammad! you are the apostle of Allah and I am Gabriel." I raised my head towards heaven to see who was speaking, and Gabriel in the form of a man with feet astride the horizon, saying, "O Muhammad! you are the apostle of Allah and I am Gabriel." I stood gazing at him moving neither forward nor backward, then I began to turn my face away from him, but towards whatever region of the sky I looked, I saw him as before." One shan al-nuzūl that the Qur’an provides us with are the divisions between Medinan and Meccan verses. Medinan verses are those verses that were revealed during the Prophet’s (s) stay in Medina. The Meccan verses were verses that were revealed during the Prophet’s (s) stay in Mecca. A major indicator on whether or not a verse is, let’s say Medinan is the subject of its contents. If the verse is talking about Islamic rules, hypocrites, socio-political matters etc., we know the verse was revealed in Medina as this is where these subjects were dealt with. However, if the verses deal with matters of fundamental belief, polytheism, etc., then we know that the verse was likely to have been revealed in Mecca. The Qur’an is divided into a 114 chapters, also in non-chronological order. The order of the Qur’an, its chapters as well as its verses were all set by the Prophet Muhammad (s) himself in order to maximize the potential for guidance as we saw in our last lesson. We know this as the Prophet Muhammad (s) himself was the one who compiled the Qur’an, it was only during the time of the third Caliph Uthman that Imām ʿAlī (as) turned it into a standard book format to be mass produced. The Qur’an is in the Arabic language. The Arabic language in itself is not holy, but the Arabic language of the Qur’an is. According to a hadīth from the sixth Imām Jaʿfar al-Sādiq (as), the Qur’an was revealed in Arabic because the Arabs at that time were the worst of people. Allah, as Imām al-Ṣādiq (as) explains, always sends Prophets and Scriptures to the worst of people. According to Imām al-Sādiq (as), another reason why the Qur’an was revealed in Arabic is because the Arabs in their pride would never have accepted a book in a language other than Arabic. As a sign of respect, Muslims must handle the Qur’an carefully and make sure to have upmost respect for it. This means that one should never leave it on the floor, or throw it. When touching the Qur’an, one must always have ritual purity, in other words, be in a state of wudū before touching its letters. Is the Qur’an in chronological order? What month was the Qur’an revealed in? Was the Qur’an revealed all at once? No, it was revealed gradually in a span of two decades. How many chapters does the Qur’an have?